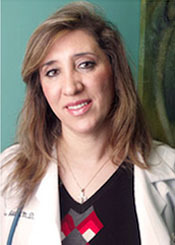 Dr. Maha Abboud, M.D., F.A.C.E. Home Our EndocrinologistsDr. Maha Abboud, M.D., F.A.C.E. Founder & President of Diabetes, Osteoporosis, Obesity, Inc.
2009, Teacher of the Year Golden Apple award, Attending Physician of the Year, and was the Director of Diabetes Center at West Suburban and Westlake Hospital. Dr. Maha Abboud is very passionate about teaching and as an excellent educator, she is a domestic and international speaker for many drug companies. She educates other physicians about new products and how they affect the pathophysiology of various diseases. Dr. Abboud’s passion for diabetes care and endocrine disease is powerful and clear to her patients. American Association of Clinical Endocrinology AMA.